O2 extraction is eventually exceeded. 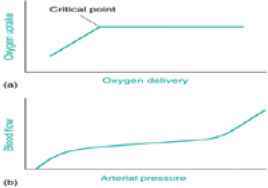 Tissue O2 uptake then becomes dependent on O2 supply, a point referred to as the 'critical' O2 delivery (Fig 1(a)). Since an adequate O2 delivery is critical to maintain cellular metabolic function, O 2 supply dependency, even if present only in selected organs, heralds the onset of cellular ischemia. If uncorrected, organ failure and death are inevitable consequences ( Sh,o®m,§k§L§i,,§(., 1992,). Fig. 1 (a) Relationship between O2 delivery and O2 uptake. Physiologically, O2 uptake is not dependent on O2 delivery. O2 uptake becomes dependent on O2 delivery, if O2 delivery falls below the critical point. (b) Relationship between blood flow and arterial pressure (in skeletal muscle). Note that blood flow is well maintained over a wide range of arterial pressures. This relationship implies that any fall in blood pressure eventually results in a decrease in O 2 delivery. However, the relationship of pressure to flow is non-linear; as blood pressure falls, local autoregulation (particularly in the vital organs) maintains organ blood flows (and hence O 2 delivery) across a broad range of perfusion pressures (Fig 1(b)). Thus, autoregulation of cerebral blood flow usually maintains adequate oxygenation to the brain until the mean arterial blood pressure falls below 50 to 60 mmHg. Blood flow and organ O2 delivery then become dependent on perfusing pressures—the lower the perfusion pressure, the lower the blood flow. Autoregulation of an organ's blood flow is locally mediated by release of factors which complicate ischemia (e.g. 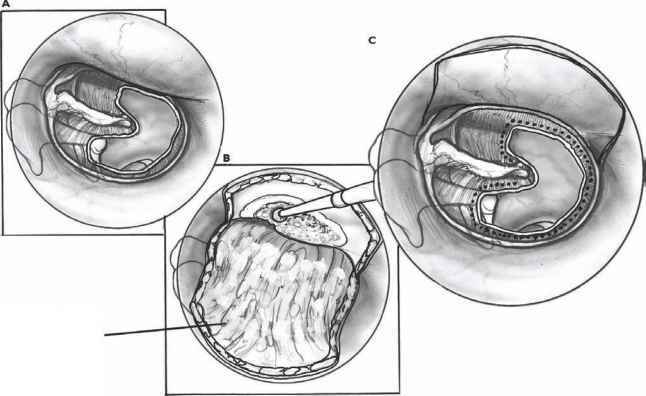 adenosine, CO 2, lactic acid) and activation of stretch receptors in the vascular smooth muscle of small vessels (Guyton.and Hall 19.9.6).